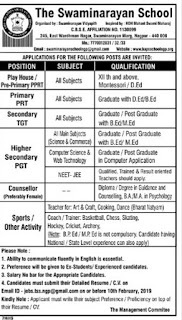 The Swaminarayan School,Nagpur,Maharashtra has advertised for the recruitment of Teaching Faculty- Pre Primary Teachers,PRTs,TGTs jobs vacancies. Interested and eligible job aspirants are requested to apply with resume on or before 10th February 2019.Check out further more details below. No addictionsNo stealingSpeak Only TruthMoral purityPure vegetarian dietAnd for total perfection , the Lord emphasized the need of the ideal devotee. Just as Lord Krishna is worshipped along with Radha as Radha-Krishna and Lord Rama with Sita as Sita-Rama , Lord Swaminarayan ( Purushottam )and his ideal devotee Swami Gunatitanand ( Akshar ) are worshipped together as “ Akshar Purushottam”. After Gunatitanand Swami , His first spiritual heir , Lord Swaminarayan has ever remained on earth through an unbroken chain of Spritual Heirs – Bhagatji Maharaj , Shastriji Maharaj , Yogiji Maharaj and at present His Divine Holiness Pramukh Swami Maharaj. 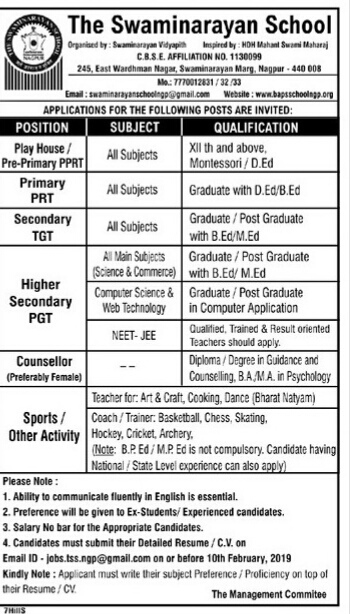 Salary Package:Salary no bar for the appropriate candidates. How to Apply: Candidates must send their detailed resume on given email id on or before 10th February 2019. Note:Applicant must write their subject preference proficiency on top of their resume/cv.